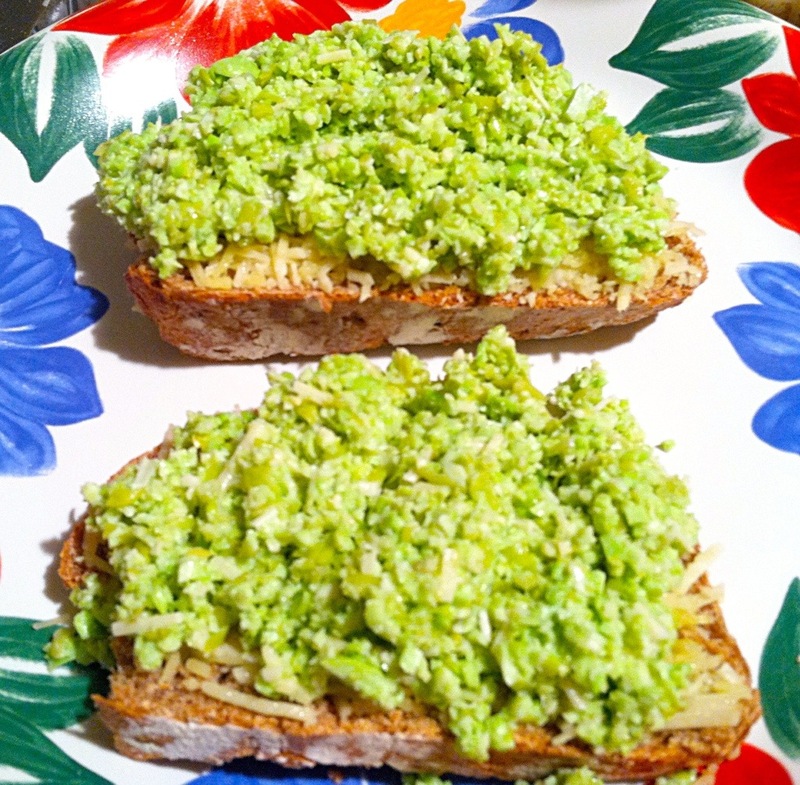 Open-Faced Lemon-Parm Edamame Sammy on Wheat Pepper Bread | sandwich surprise! Happy Thursday! On offer today? Another veggie-friendly sammy, because I’m about to go on a tear of meatatarian recipes over the next few weeks. In case it encourages the meat-lovers among us (me included) to keep reading this recipe, this sandwich actually made the Tofurkey-hating, caveman-size-steak-preferring guy here at home happy. I plan to be back to full-on Sandwich Surprises next week–either with suspecting or unsuspecting folks–like when my fellow bus travelers to Atlantic City got to try the fig spread/cheddar bread concoction a couple weeks ago. Maybe the guys who patrol the nearby apartment complex parking lot and help keep my neighborhood safe? We shall see. Anyway, if you want to make the Whole Wheat Pepper Bread, you can skip to the recipe below first. But for the fast version, just buy a crusty boule, and heat it in your oven at 300˚-325˚ til it’s fully warm to the touch, and in the meantime, make the Edamame Spread. Follow the instructions on the bag for heating the edamame. 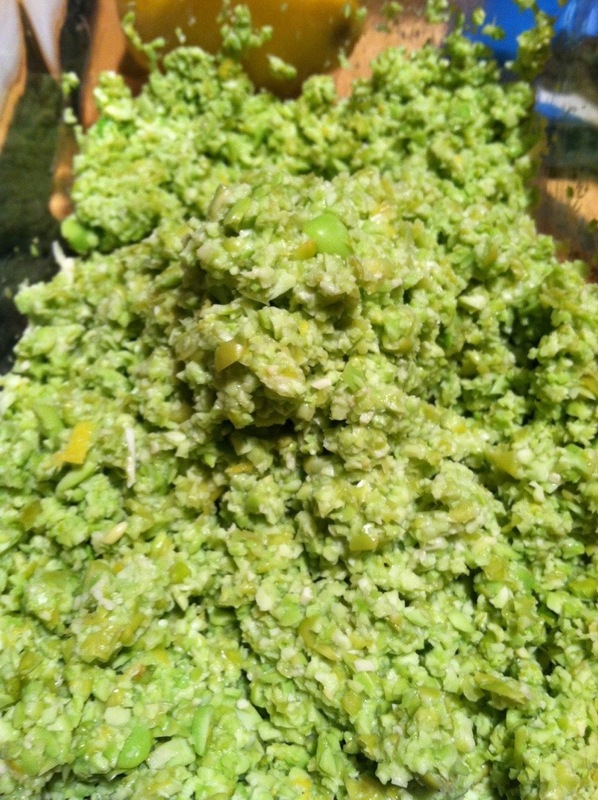 Then zest one lemon on top of the soybeans, squeeze in the lemon juice and stir in 3 tablespoons of shredded parm. I didn’t go for a hummus consistency because having something besides the bread to gnaw on is key for me. But you can purée it more if that’s your thing. Then sprinkle a healthy portion of shredded parm on a slice of bread and nuke it for 30 seconds (again, I have a weak microwave, so you might only need 15 secs). 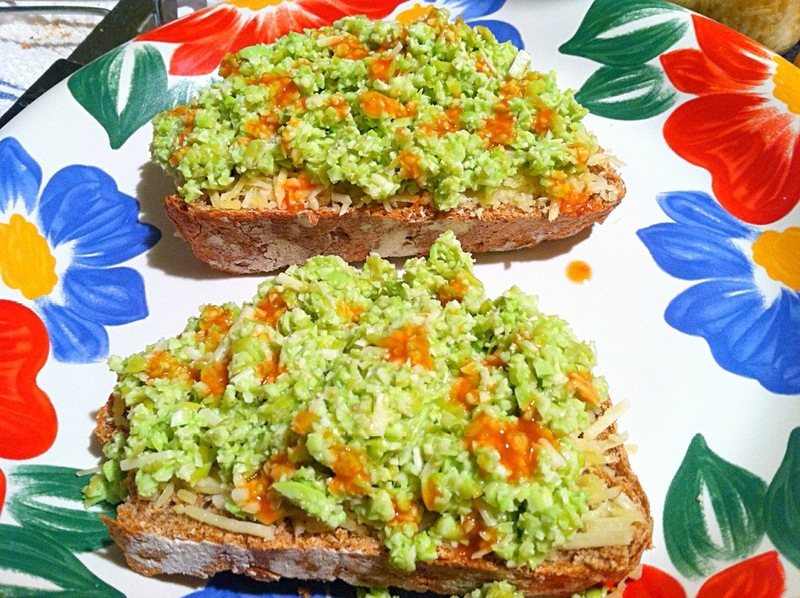 Spoon the edamame spread on top of the cheesy bread. … and “This is really good!” after that. But I wasn’t sold. 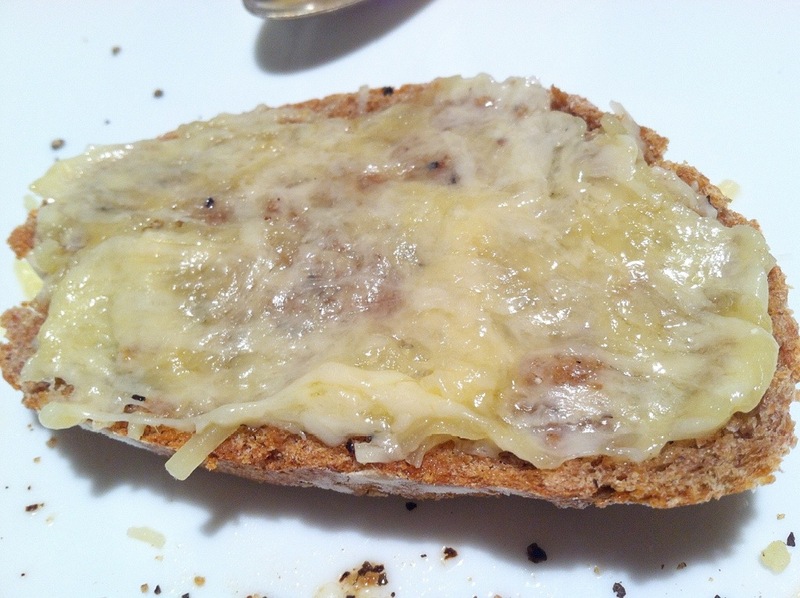 I got mine almost to where I wanted it by adding fresh chopped tarragon and squeezing more lemon juice on the spread. Almost. I love my edamame and I’ll try this again, if only to see if I can ratchet the flavor up a bit more. For some reason, garlic struck me as too heavy a flavor this. Any suggestions for adds? Please comment and let me know! Oh, and if you want to be Sandwich Surprised some day, head to my Sandwich Surprise Facebook page, like my page, and post a comment. I tend to be mostly in the NYC-NJ area, but if I’m traveling, who knows? 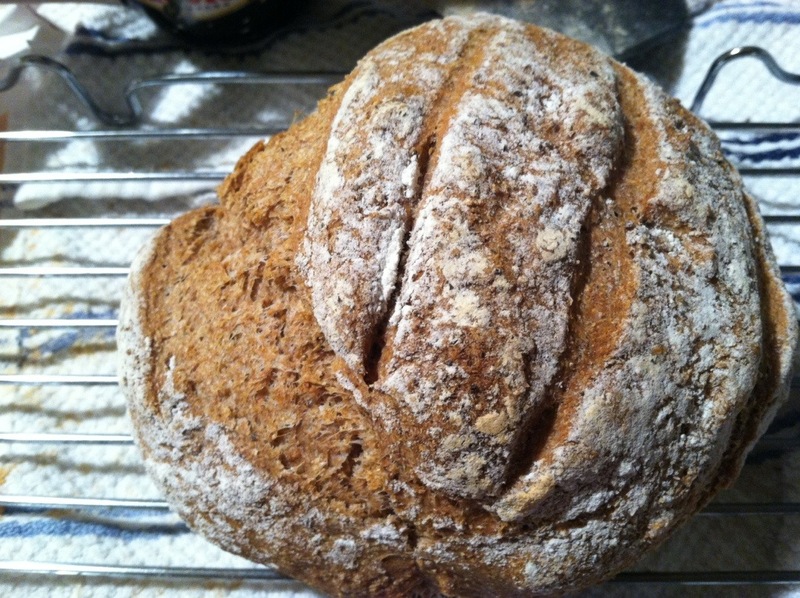 I tweaked the Master Boule recipe in Artisan Bread in Five Minutes A Day by subbing in organic whole wheat flour (the hard red wheat kind, not white wheat or soft wheat) for the all-purpose flour. I’m sure the all-purpose-flour version is delicious, though. Mix the yeast, salt and sugar with the water in a large lidded container, and let this stand for 20 minutes to get the yeast going. Then combine the flour and black pepper together before mixing that into the yeast water with a spoon. You may have to work in the last stubborn bits with your hands, but wet them first and add water to the dry flour a tablespoon at a time, only as needed, and be careful not to overwork it. Cover the container by lightly resting the lid on top, but not actually sealing it, and let it rest for 2 hours until it rises, then flattens on top. Then stick it in the fridge for about an hour to make it easier to work with. Preheat oven to 450˚ about 40 minutes before baking. Place a broiler pan on the rack not being used for the bread. And if you have a baking stone handy, place it on the center rack. Dust the top of the dough and pull off about 1/5 of it into a nearly 1 lb., grapefruit-sized chunk, and shape into a ball using the King Arthur Flour blog technique (pinch the sides of the bottom down and roll that lightly in the palm of your hand). Let it rest and rise for an hour, then put the ball on a Silpat baking pad lightly dusted with flour (or a pizza peel dusted with flour, should you have one handy). Put the dough and Silpat in a baking pan and stick it on the center rack in the oven (or slide the dough ball from the pizza peel onto the baking stone). Also make sure to pour a cup of water in the broiler pan to create a steam effect. Bake it for 30 minutes, then turn off the oven. If you want to assure extra crustiness, you can leave it in there for another 5 minutes after the oven is off. Take the loaf out and let it cool enough until you can hold the loaf comfortably, then use the serrated bread knife to cut 1/4″ slices. what a creative idea, i love it! I am obsessed with Trader Joe’s edamame hummus and based on that would definitely recommend garlic. Although I can see where you’re coming from on worrying about it overpowering the mild edamame, it actually enhances the flavor of the edamame itself and adds the needed pizazz you might be looking for. Other great add-ins are cumin, chives, onion powder, grated onion or a tiny bit of fresh basil – but from experience I have found that basil can very easily overwhelm the entire recipe so start very sparingly! 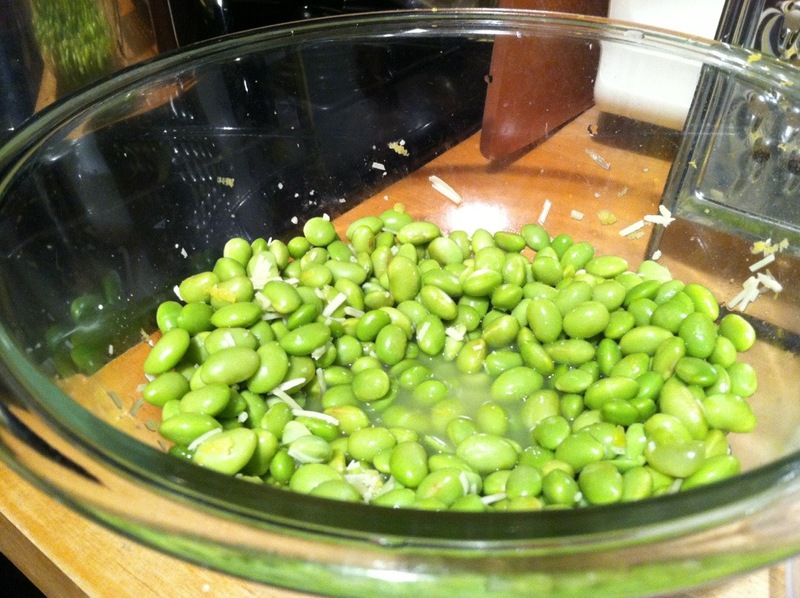 Most copycat recipes for the trader joes edamame hummus use tahini or sesame oil. A lot of people use parsley but I’m not a huge fan. Great suggestions — I didn’t even know there was such a thing as edamame hummus. Will have to check it out. Thanks, Melinda! Thanks! If you have any suggestions for things to add to it, let me know!